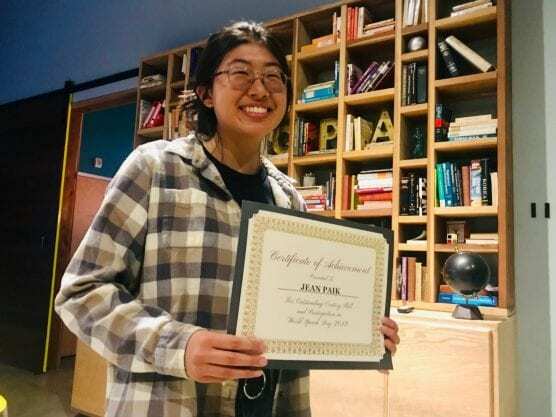 Jean Paik stands with the certificate she received after speaking at the first Santa Clarita World Speech Day event, March 16, 2019. | Photo: Caleb Lunetta/The Signal. In a room filled with at least 75 young speechmakers, Santa Clarita students celebrated their city’s first ever World Speech Day on Saturday. Largely organized by Valencia sophomore Cassidy Bensko, with the help of the event’s hosts, Global Prep Academy, the Santa Clarita World Speech Day celebration worked to teach students about the importance of free speech here and around the world, according to event organizers. Over the course of two hours, speakers who were both junior high school and high school age walked to the front of the room and chose to either stand behind the podium or walk in front of it while holding a microphone. The speeches given ranged from personal experiences that manifested into life lessons or oratory performances typically seen during a competitive, academic tournament. The Santa Clarita World Speech Day event was attended by more than 75 students and parents on March 16, 2019. | Photo: Caleb Lunetta/The Signal. One such speaker, Jean Paik, is a junior at Valencia High School and a competitive debater herself. However, she used her time front and center to criticize the culture surrounding the academic community she has grown to love over the years. Paik said during her speech that she understands the need to discuss atrocities around the world so humanity can learn from those things, but that selfish intent should never be a factor in those conversations — something she sees as a major theme running through her competitive debates.